This has to be one of the most bizarre stories in all of children's literature. I'm not sure which is more nonsensical - Alice In Wonderland or The Wonderful Wizard of Oz (probably A in W, but still!). Certainly I have enjoyed the movie version of this book (many times over) all during my growing up years. I know Somewhere Over the Rainbow by heart, as do many other Americans, well-versed in Hollywood classics. Judy Garland IS Dorothy and who didn't want a Toto growing up? Pop-culture references abound everywhere. How many times have you heard the phrase, "We're not in Kansas anymore"?It's still a running joke that produces laughter in well-timed moments. 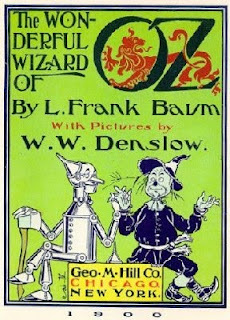 All of this we have to thank L. Frank Baum for. In my opinion, the story is pretty true to the movie (or perhaps that should work the other way around?) with relatively minor exceptions. There are some other peoples in the land of Oz that do not appear in the movie, such as the field mice, the Winkies and the China people. There is also a great deal more violence in the book, which I confess did surprise me! (Although really, I'm not sure why it should have surprised me. Children's stories have become rather toned down - gratefully so - in the last 100 hundred years. Not as many body parts being cut off! I wonder if that's due to the World Wars?) As for how the tin man became the tin man? I was reading this story aloud to my soon-to-be 3 year old until I came to the part where I discovered that the tin man became so bit by bit as his legs and arms, head and body were cut off due to an enchantment placed upon his axe. A bit too gruesome and I finished reading the book to myself! We'll save this for a read-aloud later (if there is any interest in it later on). The cast of characters, however, essentially remains the same and Hollywood did a good job eliminating aspects of the book, and combining a few details (tastefully so, I think!) to make the story flow a little bit better. I would say that if you've seen the movie, you've probably seen a better story than the book offers. (You can start throwing those tomatoes now.) One thing I LOVED about reading the book is seeing how accurately Hollywood potrayed Scarecrow and the Tin Man. They really paid attention to the original illustrations by W.W. Denslow when they created the onscreen characters! Remarkable similarities and I really enjoyed that aspect of the book! My complaint with the book is that it's just ....goofy. It doesn't come across as polished as the movie version is. In this case, I think I've gotta say that the movie is better than the book! The Great and Powerful Oz is still a humbug, the lion cowardly, Dorothy wants to get back to Kansas and they still travel down a yellow brick road (in the book she wears silver shoes, not red). But in the movie you get to hear Judy Garland sing and Ray Bolger dance about in a silly fashion which is lots more fun! The perk, if you will, to the book is that the Wicked Witch is toned down dramatically and does not make an appearance until the end of the story. (I was rather surprised by this.) However, there is a lot of talk in the book about good witches vs. bad and wizards also. There is not as much of an emphasis on these things in the movie, but we have the constant presence of the Wicked Witch herself. I thought the book was less clear about the distinction between good and evil because it was confusing as to who was good and why. The movie is much more bold in describing the distinction between good and evil, if in no other regards than by giving us a visual. I'm glad to have read this book but I think I'm too enmeshed in the 1939 screen version to be able to really enjoy it. For my part, I'm somewhere over the rainbow, for sure! Interesting-- I've never read it, but I imagine it must be pretty out-there! I read somewhere that the book was originally written as an allegory about economics. That might account for some of the oddities contained within it. I remember from when I taught high school history that there is so much more to this story--it's very much about the politics/economics of the day, as Calon Lan said. And, as Book Psmith said, I'll probably skip it as a read aloud after OUR Mary Poppins experience. Calon Lan & Amy - I did not pick up on the allegory but e-mailed Calon Lan on the side to ask for her take on that. She pointed out that it wasn't a well written allegory, but it is proported to be about economics. According to the biography I just read about him (review to be posted tomorrow) that didn't really play into it. But! The biography was focused more on Baum's spiritual life. Dawn - yes, they did change the color of Dorothy's shoes for the movie just for that reason! I still haven't read this. I own it though and I am definitely planning on reading it EVENTUALLY. I really love the movie as well and I always worried that the book wouldn't live up to my expectations. I guess after reading your review that must be a valid concern. Still, I feel like it's probably a book worth reading.